Keeping up with the new pace of change requires building agility into your business to adapt to change faster, while carefully overseeing your investments. The integrated solution of CA Project & Portfolio Management (CA PPM) and CA Agile Central (formerly Rally) helps you effectively balance agility and governance by connecting the work of agile teams to your enterprise portfolio. 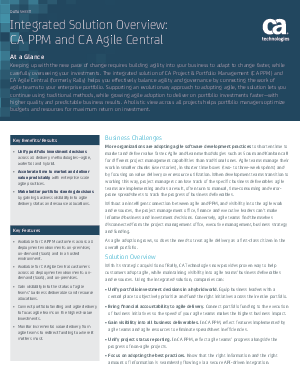 So read this paper to learn how an evolutionary approach to adopting agile supporting an evolutionary approach to adopting agile, the solution lets you continue using traditional methods, while growing agile adoption to deliver on portfolio investments faster—with higher quality and predictable business results. A holistic view across all projects helps portfolio managers optimize budgets and resources for maximum return on investment.